Here at Northeast Missouri Orthodontics we are proud to serve children, teens, and adults in Hannibal, MO (Missouri) and the surrounding areas with quality orthodontic care. 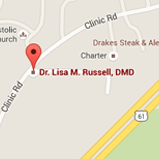 Lisa M. Russell, DMD has rapidly gained a reputation for her caring treatment and her dedication to giving patients the radiant smiles they deserve. Our family-friendly practice is based on personal care. With an excellent staff, our office is designed to put you at ease and help you feel at home before, during, and after treatment. We believe that education is tantamount to maintaining oral health, and we are here to answer every question as we help you achieve a perfect bite and smile. A lifetime of beautiful smiles starts here! Contact our Hannibal office to schedule a complementary consultation for yourself or a loved one today.